Native jewelry styles were different in every American Indian tribe, but the differences were less marked than with other arts and crafts, because traditional Indian jewelry and the materials used for making it (beads, shells, copper and silver, ivory, amber, turquoise and other stones) were major trade items long before European arrival in America. After colonization, Native American jewelry-making traditions remained strong, incorporating, rather than being replaced by, new jewelry materials and techniques such as glass beads and more advanced metalworking techniques. There are two very general categories of Native American jewelry: metalwork, and beadwork. Before Europeans came native metalwork was fairly simple, consisting primarily of hammering and etching copper into pendants or earrings and fashioning copper and silver into beads. After Navajo, Hopi and Pueblo artists learned silversmithing from the Spanish in the 1800's, metal jewelry arts blossomed in the Southwest, and distinctive native jewelry like the squash blossom necklace, Hopi silver overlay bracelets, and Navajo turquoise inlay rings developed from the fusion of the new techniques with traditional designs. Native beadwork jewelry, on the other hand, was already extremely advanced in pre-Columbian times, including the fine grinding of turquoise, coral, and shell beads into smooth heishi necklaces, the delicate carving of individual wood and bone beads, the soaking and piecing of porcupine quills, and the intricate stitching of thousands of beads together. Porcupine quillwork has nearly died out (though some young artists are taking a renewed interest in it) but all of these other forms of beaded Indian jewelry are still going strong today. You can see our Native American beadwork page for more information and pictures about different beading arts. If you are looking to buy jewelry that was actually made by Native Americans--either because it's important to you to have the real thing or because you want to support native people with your purchase--then here is our list of American Indian artists whose handmade jewelry is available online. If you have a website of native jewelry to add to this list, let us know. We gladly advertise any individual native jewelry artist or native-owned jewelry store here free of charge, provided that all jewelry is made by tribally recognized American Indian, Inuit, or First Nations artists. Thank you for your interest in Native American jewelry! On our main site we do our best to avoid slowing down our page loading with graphics, but this page is about art, so we'd really be remiss in not showing a few representative jewelry pictures. All photos are the property of their respective artists; please visit their sites to see their work in more depth. Be aware that all traditional Native American jewelry, including all the work on this page, is handmade, so it is going to be priced accordingly. If you are shopping for real Indian jewelry but find most of it too expensive, try looking at the earrings--those are often an affordable alternative to the larger pieces while still being authentic. The most impressive history of traditional jewelry-making in North America belongs to the Navajo, Hopi, Zuni, and other Pueblo artisans who worked native silver and semiprecious stones into distinctive inlay and overlay designs. Southwestern Native American jewelry art remains a strong and vibrant tradition today, and their artwork is prized both tribally and internationally. There is also a thriving trade among collectors for something called "old pawn" or "dead pawn" Indian jewelry. Basically this is antique Native American jewelry which was pawned by Navajo and other Southwest Indians in such desperate financial straits that they were never able to reclaim them, or else taken away from Indian families by debt collectors, or, as is sometimes the case with pawned goods, dumped off there by thieves. Frankly, I'm very uncomfortable with dead pawn jewelry; though modern dealers haven't done anything wrong, most of the pawn jewelry was originally acquired through trickery, usury, thievery, extortion, or, in the very best scenario, acquired honestly from Indians suffering from such extreme poverty or alcohol addiction that they sold the only thing they had left of value, their mother's jewelry. Well, this is not jewelry in a positive spiritual state, and buying it will not honor or pass even one dollar along to the artist's descendants or any other native person. Why not buy some of the beautiful jewelry made by the many talented Southwest Indian artists still working today, instead? Here are some good places to buy fine Southwest Native American jewelry, guilt-free, and support the ongoing Indian jewelry-making tradition with your purchase. A gorgeous selection of Native American silver jewelry by a Taos Pueblo artist. He makes custom pieces to order, too, so if you want something truly one-of-a-kind, send them a query email. Silver and beadwork jewelry in a wide variety of Southwest Indian styles, sold by a Navajo tribal art enterprise. These Navajo, Hopi, and Pueblo artists are making stunning Southwest American Indian jewelry in traditional and modern styles. Innovative contemporary-style jewelry by a young Navajo artist using his people's traditional silver and stone inlay techniques. Beautiful turquoise and silver Indian jewelry for sale online by a Navajo artist. 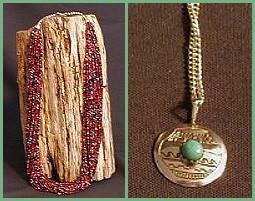 Native turquoise jewelry and multi-strand Indian necklaces from a Navajo family craft shop. Handcrafted silver overlay jewelry by Hopi, Navajo, and other Southwest Native American artists. Modernist American Indian jewelry by another talented Navajo artist. Squash blossom necklaces and other handmade Southwest Indian jewelry from a Laguna Pueblo artist. Though silver-smithing was an art most North American tribes imported in recent times from the Southwest Indian artists or from European-Americans, smiths from different tribes enriched the craft by combining it with their own people's symbols, designs, and jewelry traditions. Dramatic Coast Salish and Kwakiutl silver and gold jewelry designs carved by Northwest Indian artist Gilbert Pat. This is just about the most beautiful jewelry I've ever seen anywhere. This Lumbee Indian family makes jewelry out of purple and white quahog shell--the same material traditionally used for wampum beads. Traditional heavy silver bracelets and belt buckles by a Potawatomi silversmith. The beadwork jewelry of the Sioux Indians and other Great Plains tribes is most famous, with its intricate peyote jewelry and bone hairpipe chokers. However, there are many other types of jewelry beading traditions throughout North America, ranging from the wampum jewelry of the eastern Indians to the shell and turquoise heishi necklaces of the southwestern Indians and the dentalium necklaces of the west coast Indians. Here are some fine examples of different Native American beaded jewelry styles. 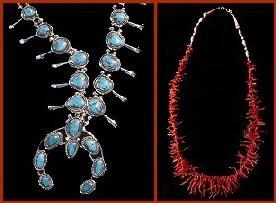 Beautiful Plains Indian jewelry by two Blackfeet artists. They make other Blackfoot regalia like bone hairpipe breastplates, too. Contemporary Indian jewelry by a Red Lake Ojibwe artist. Email her for prices. California Indian jewelry made traditionally out of abalone, dentalium, and other shells. Unfortunately, they no longer have online jewelry sales, but the shop is still in business at its physical location-- if you phone them at 530-623-9393 they may be able to ship to you. Another great tribally owned craft shop that no longer sells jewelry online-- you can browse their old site above and give their store a call at (307) 332-6001 if you're interested in their fine Arapaho and Shoshoni native beaded jewelry. Beautiful book showcasing Native American jewelry design from different tribes. Expensive, but if you're a serious collector or art historian, it's very informative. Photographic exploration of native Southwestern jewelry from ancient to modern times. Fascinating documentary on the traditions behind Southwest Indian silver jewelry. Art history and photographs of Hopi Indian jewelry. Art history and photographs of Navajo Indian jewelry. History and craftsmanship of Zuni native silver jewelry. Antique Indian Silver Jewelry: Article on the history of Navajo and other southwest Indian silverwork. Heishi Jewelry: Article on the history and crafting of Native American necklaces from heishi beads. The History of American Indian Jewelry: Actually only the history of Southwest Indian turquoise and silver jewelry, but still informative. Beads and Beadwork: Meaning, history, and techniques of American Indian beaded jewelry in various tribes. 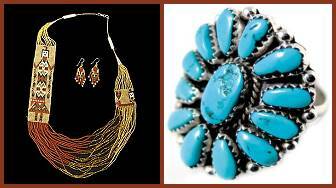 information about Native American turquoise jewelry. Quill Jewelry: Interesting site about the little-known art of quillwork jewelry, with instructions for how to make Indian jewelry from porcupine quills. Turtle Trade Craft Supply: Iroquois-owned online store selling turquoise, quills, beads, and other Indian jewelry supplies. American Indian Jewelry: Orrin contributed to this larger directory of authentic crafts made by Native American Indians. About us: This website belongs to Native Languages of the Americas, an non-profit organization dedicated to preserving and promoting endangered Native American languages. We are not artists ourselves, so if you are interested in buying some of the jewelry featured on this page, please contact the artists directly. Though we have featured only Native American jewellery identified with the name and tribal affiliation of each artist, we haven't called the tribal offices to check up on any of them, and we only know a few of them personally. We also don't guarantee any of their products. This is not an exhaustive list of Native Indian jewelry--if you would like us to add your jewelry site to this page, please contact us with your URL and tribal affiliation. We advertise any individual native artist or native-owned art business here free of charge. We do not link to "dead pawn" jewelry, or to jewelry which is not made by tribally recognized American Indian, Inuit, or First Nations artists. And finally, websites do occasionally expire and change hands, so use your common sense and this general rule of thumb: if the creator of each individual artwork is not identified by name and specific tribe, you are probably not looking at authentic American Indian jewelry.